My website has moved, please come with me! My website has moved to http://www.hamilllawoffice.com/, which will now have the most up to date information for you. If you have subscribed to this site by email, you can enter your email address at the new site to continue to get updates. Likewise, if you subscribe by RSS you can get the new RSS feed over there. P.S. If you are overwhelmed caring for your elderly parents and need help now, just click here: Yes, I'm Overwhelmed! Accepting your feelings. Just because the media and other may make it seem likely everyone else is happy, it's perfectly normal to not feel happy all the time. Volunteering. Helping other can make us (and them) feel better. Recognize the signs that your blues may be something more serious. Include older loved ones in activities to show them they are still a valued member of the family. Reach out to people who love and support you. The full list can be found here. Beating the Holiday Blues. Thanks to Sue Scheible for sharing this important resource. Is there adequate lighting inside and out to prevent falls? Is the refrigerator stocked with food? Is any of it spoiling? Are there any throw rugs that could cause falls? Is their mail piling up unopened? Are your normally tidy parents having a harder time with housekeeping? Is their house warm enough? Do your loved ones seems healthy? Just because you notice some issues, doesn't mean your parents can't be living at home. It may mean that you need to bring up having someone come in to help with meals or housekeeping, offering to help out with mail (like canceling unwanted catalogs or charitable requests), having someone come in to hang safety rails, hiring someone to shovel the walk this winter. When broaching these subjects, be gentle. Do not suddenly announce that you are taking over and getting things in order. Do not begin divvying up tasks with your siblings without talking with your parent first. They may welcome your help, but they will be much more receptive if you remember that it is their house and their life and proceed accordingly. If you need help talking to your parents, a coach or care manager can help. And remember to enjoy the holidays! a health and human services specialist who helps families who are caring for older relatives. The GCM is trained and experienced in any of several fields related to care management, including, but not limited to nursing, gerontology, social work, or psychology, with a specialized focus on issues related to aging and elder care. A recent New York Times article reminded me of the many ways in which these professionals help my clients. 1. When my clients (or their children) say "what can be done to keep me at home as long as possible" I will recommend that they have a GCM come out and do an evaluation of the home, to make sure it is safe. Often, a fall at home can spiral into more and more medical problems, necessitating nursing home care on a short or long term basis. Preventing slips and falls can keep someone out of a nursing home. 2. When my clients are thinking about moving in with their children, a GCM can meet with the family and talk to them about what to expect, how to best set up the home, and how to plan for regular breaks for the care-giver so they don't get overwhelmed. 3. When my clients are thinking of moving to an assisted living facility and want some assistance choosing the right facility, a geriatric care manager can help. GCM's are generally familiar with the facilities in their area, and can offer their experiences with previous clients who may have been residents there. A GCM can also visit the facility with someone to make sure the right questions are asked. 4. When my clients need more assistance at home from a personal care attendant, visiting nurse, non-medical companion, or a combination - the GCM can oversee the team, making sure there are no duplications of services, and no holes. 5. A GCM can also talk to an older person about stopping driving, or to allowing more help into the home, when the client's child has difficulty broaching these subjects with their parents. 6. If family members can't agree on what to do with a parent who can no longer make decisions for themselves and who should play what role, a GCM can attend family meetings to help iron out these decisions. 7. Adult children who live far away will often hire a GCM to be their eyes and ears on the ground - accompanying their parent to medical appointments, overseeing the care givers in the home, and alerting the child to changes the parents might not bring up. GCM's can be an integral part of the elder care team. They work hard to make sure that there is a good fit between the care manager and the client. And they can be hired for a one-time project, or take on a complex case for the long haul. Whether you are a current client of mine, or have just started looking for assistance for yourself or your aging parents, I can provide you with a referral to a GCM. Just call my office at 781-749-2284. Estate Planning, Probate and Trusts involve complex areas of law. Individual circumstances must be considered before any advice can be given. The general information above is not to be construed as legal advice, which can only be given after consideration of the unique facts of each matter. Please seek the advice or counsel of your attorney, financial advisor or CPA as it may be appropriate. As people get older and sicker, they may find themselves going to the hospital more frequently - either for planned appointments or emergencies. Being prepared for these visits can go a long way towards making them less stressful. Telephone card and small amount of cash for incidentals. If you can, leave jewelry and other valuables at home. One other tip, make sure the telephone is next to your bed. I was recently trying to contact a client in the hospital (I am his Health Care Proxy so I needed to speak with him) and he wasn't picking up his phone. I called the nurses station to find out what was wrong. It turned out that his telephone was across the room. Since he couldn't get out of bed, he couldn't answer the telephone. They moved his telephone, and I could finally get through. If you haven't updated your health care proxy in a few years, don't have a HIPAA release so that your doctors can talk to your family members about your condition, or just want to get your affairs in order before going to the hospital, call my office at 781-749-2284 for an appointment. I had the pleasure of speaking with Barbara Friesner, of AgeWiseLiving, on her AgeWise Living Radio Show about Why and How to Avoid Guardianship and Conservatorship (click to listen to the recording.) You may want to turn the volume down on your computer before clicking the link to the show, since the audio starts right away. I talked about what a guardianship and conservatorship are, why one or both would be needed, what the process is for obtaining them, what the costs associated with them are, what families can expect when them embark on seeking protective proceedings over a loved one, what the responsibilities are of the guardian or conservator once they are appointed, and most importantly, what some of the alternatives to these proceedings are that can provide the elder or disabled person with the support they need, while maintaining their rights and keeping family relationships intact. I had a great time talking to Barbara about these issues, and hope to do it again soon. When you are ready to put a plan in place for yourself to insure that you won't need a guardian or conservator, even if you become incapacitated, call me at 781-749-2284. And if you are the child of a parent who failed to make a plan and is now incapable of handling their affairs, and you find yourself running into roadblocks in talking with their doctors or dealing with their finances, call me to find out what your options are. All the links will open in a new window, so feel free to click as you read knowing you won't lose this page. Shambala Sun , the Buddhist magazine, focuses their recent issue on caregiving and illness. They have an audiodownload by Frank Ostaseki whose mission is to seed "our culture with innovative approaches to end-of-life care that reaffirm the spiritual dimensions of dying." On July 6th he will be taking questions from people about caregiving and practicing with an illness. Babyboomer Knowledge Center has a recent article on talking to your parents about when to stop driving. Given all the talk in Massachusetts about retesting older drivers, you may be having this conversation sooner than you think. AgeWiseLiving, a fantastic resource for caregivers, offers a caregiver success kit along with teleseminars, and a radio show. I will be speaking on the show on July 29th about guardianships so subscribe to my site (by putting your email address into the box on the right) to get notification of the show. And remember the instructions by the flight attendants to "put on your own oxygen mask before helping someone else with theirs." Take time for yourself every day and don't wait to ask for help when you need it. Today's post is written by Generational Coach Barbara Friesner of AgeWise Living. Barbara works with the family members of the aging person, not the elder themselves. I typically work with the family and the elder, but I consider the elder to be my client. Barbara's post outlines the many different living situations open to a person who is growing older and needing more assistance. As you can see, the choices aren't just "home or nursing home." An elder law attorney can assist in the case of an elder in transition by making sure their important documents like health care proxies, wills, durable powers of attorney and other documents are up to date and still reflect a person's wishes. An attorney can also assist with referrals to home care agencies and geriatric care managers, and help the family determine how the care will be paid for. As a Generational Coach, I work with family members (only the family – never the senior). I help them know what to do and how to communicate effectively so their aging loved one will actually do what’s in their best interest. I help them with all sorts of issues but one that comes up frequently is should Mom and/or Dad live at home (which may be too much for them or perhaps is no longer safe) or move into a nursing home. Why those two options – all or nothing – home or a nursing home? Because often those are the only 2 options they know. And unfortunately, most of the time, the family calls me after they’ve mentioned the nursing home option to their aging loved one and now their aging loved one won’t talk to them any more! • Hygiene such as bathing, toileting, incontinence care, grooming and dressing guidance, etc. ~ Move into a smaller, more manageable home. Senior Apartment: Age-restricted multiunit housing for older adults who are able to care for themselves. Usually no additional services such as meals or transportation are provided. Independent Living: a residential living setting for senior adults that may or may not provide hospitality or supportive services. Under this living arrangement, the senior is independent and requires minimal or no extra assistance. Generally referred to as elderly housing in the government-subsidized environment, independent living also includes rental assisted or market rate apartments or cottages where residents usually have complete choice in whether to participate in a facility's services or programs. A continuing care retirement community (CCRC) offers several levels of assistance, including independent living, assisted living and nursing home care. It is different from other housing and care facilities for seniors because it usually provides a written agreement or long-term contract between the resident (frequently lasting the term of the resident's lifetime) and the community which offers a continuum of housing, services and health care system, commonly all on one campus or site. An Assisted Living community provides a combination of housing, personalized supportive services and health care designed to meet the needs – both scheduled and unscheduled – of those who need help with activities of daily living. A nursing home provides 24-hour skilled care for the more acute patients (one step below hospital acute care). Patients generally rely on assistance for most or all daily living activities (such as bathing, dressing and toileting). Regular medical supervision and rehabilitation therapy are mandated to be available, and nursing homes are eligible to participate in the Medicaid program. These facilities are State Licensed and pre-admission screening is usually required. As you can see, there are a broad range of options between ‘all or nothing’. And there are other options and variations within these options. And remember, if you are concerned that your elderly parent needs help now or may shortly and you don't know how to proceed, I urge you not to wait for a crisis to develop. Please call me toll-free (877) AGE-WISE or email me at Barbara@AgeWiseLiving.com for a complimentary "get acquainted" conversation. I'm here to help! If you or your parent is in transition and wondering what your options are, are wondering how you'll pay for the different living situations, or you want to make sure your estate documents are up to date and still reflect your wishes, please call my office to make an appointment at 781-749-2284. Authorities are warning of new scams targeted at the elderly. The latest attempt to defraud seniors is a phone call from someone pretending to be a grandchild who is in trouble. The plea to keep things quiet from other family members can make the scam successful, since the grandparent wants to protect their grandchild and help them out of a bind. They will request that you wire money somewhere because they have been arrested, been in an accident or are traveling and have been robbed. Callers who just say “It’s me” or “It’s your favorite grandchild” and don’t give their name. Don't fill in the missing information. If they say "It's me" ask "Who?" Tell the person that you will call them back. If you don't have a grandchild's number, call a trusted family member for the information. Never give account numbers over the phone. Be very suspicious of calls requesting money to be wired somewhere. Always ask for verification of the identity of the caller. If it is really your relative they won’t mind. And if it’s not, you can get off the call quickly and alert the police. Contact your local police non-emergency number to report the scam. Contact your bank if you wired any money. Don't be embarrassed to tell a family member about what happened. It's natural to want to help out a family member, but a real family member won't mind that you are trying to keep yourself safe, and the fake one will be out of luck. Even in close families, issues can come up that need an outside party to help deal with them. Caring for an aging parent while dealing with siblings (and their spouses) can make a difficult task even harder. Inheriting property from parents that you now own jointly with several siblings can seem like an unwelcome gift when no one can agree on what to do with it. Feeling like you were left out of a Will unfairly can make the death of a parent seem that much more devastating. It's not uncommon to hear one sibling bitterly tell another: "Mom liked you best." Larsen says long-established family roles can play out the moment siblings walk into a mediation. "When they come in a room and sit at a table, they'll very often take the position they took at the dinner table 30 or 40 years ago without even realizing it," he says. Good mediators make sure that the older person's voice is heard. Bob Rhudy, an attorney and mediator in Baltimore, says that's important even when someone has Alzheimer's or dementia and might have trouble following the conversation. "Even when there may be some fairly substantial limitations on capacity, people have the ability to say what family member that they are comfortable with, who they care for, respect, trust, where they like to live," says Rhudy. "They may not have the capability to make substantial legal or financial decisions, but they certainly have the ability to express opinions and wishes and desires. helping families who are arguing over a Will or Trust resolve their issues. Sometimes people turn to litigation as a first resort when in a dispute about property or a Will, but I often encourage people to explore mediation first. It is private (no Court room drama here), much less costly, confidential (no public record) and voluntary. And most importantly, it can help keep the family relationship as the focus, rather than as the first thing to give up. We are lucky to have another guest post by Barbara Friesner of AgeWise Living, a generational coach who works with families around issues of aging, care-giving and helping siblings maintain or improve their relationships while one or more of them is caring for an aging parent. Barbara has generously offered my readers a 10% discount on any of her products for care-givers. Call her at 877- AGEWISE (243-9473) to receive the discount. Eldercare is hard enough without adding sibling issues to the mix but too often they’re very hard to avoid when you’re talking about Mom and Dad. As a Generational Coach, about half the time I work with just one adult child. Sometimes, however, that one person has siblings that either are not helping or are actually sabotaging their efforts. Sometimes a sibling will do that because they honestly don’t know how bad it’s gotten with Mom. Other times they do that because they know Mom doesn’t want to move and they want to be the ‘favorite’ child – so they tell Mom what she wants to hear! Sometimes it is a sincere difference of opinion on what was best for their aging loved one. For example, a 90-year old mother eats a lot of sweets and one daughter thinks she shouldn’t eat any sweets because they’re not good for her. The other daughter says that Mom doesn’t have a health issue – she just likes sweets and if she wants to eat sweets – let her! Sometimes it’s real controversy – for example, one sibling wanting to do what’s best for their parent regardless of the cost while the other sibling wants to spend as little as possible so there will be more money for their inheritance. Some children say it would be better to be an only child, but being an only child – or the only caregiver – can also be overwhelming, frightening, draining and very lonely. As hard as it may be to believe, getting help from sibs can make it easier. Siblings allow shared decision making. Ideally they will share responsibility. Your parent may take information/suggestions from a sibling better than they will from you. In fact, even those who seem “practical” or even indifferent may see things less emotionally than the stressed-out caregiver or more emotional siblings. And a sister/brother has been there – they know all the players from the inside – so they bring a perspective not even your closest friends can bring. But perhaps the most important reason to work with your siblings is the relationship you will after your parents are gone. Right now may think you wouldn’t care if you ever talk with them again but handling it in a positive way now allows you to leave the door open for future relationships – perhaps an even stronger one! I am thrilled to have today's post written by Barbara Friesner, author of The Ultimate Caregiver's Survival Guide. Barbara is an expert on issues affecting Seniors and their families. She has been featured on NY1 TV's "Focus on Seniors", "Coping With Caregiving" and on radio shows across the country. As care manager, first for her grandmother and now her mother (with dementia), Barbara learned first hand how overwhelming, stressful, and time consuming elder care can be. As a result, Barbara started AgeWiseLiving to help others navigate through this challenging time, and avoid the emotional and frustrating task of finding the answers themselves and trial-and-error implementation. The holidays may be over, but for many caregivers, the concern lingers on. I’m getting a lot of calls from people who saw their parents for the first time in months and were shocked at how they have aged. Therefore, in addition to questions to ask your parents, there are also questions to ask yourself. ➢ Is your loved one clean and well groomed? ➢ Is s/he properly dressed with clean clothes? ➢ Has s/he gained or lost significant weight? ➢ Is s/he walking well (eg: good balance and posture)? ➢ Do you notice changes to his/her hearing, sight or speech. ➢ Is s/he is more timid, apprehensive or withdrawn? ➢ Do you notice a change in short term memory? Does s/he seem confused and/or lose her/his train of thought easily and/or often? Does s/he ask the same questions and/or tell the same stories over and over? ➢ Has the neighborhood changed? Does it look safe? ➢ Is the exterior of the house maintained? ➢ Is the interior of the house neat, clean, and well maintained? ➢ Is the refrigerator stocked with fresh (or at least edible) food? ➢ Do you notice excessive clutter and things like piles of unopened mail, lots of sweepstakes offers, etc? ➢ If the home has stairs, can s/he navigate the stairs safely or does it look like s/he is now living on the ground floor because of an inability to navigate the stairs? What you see can run the gamut from "everything is fine" to "something is definitely wrong". If you see something critical or alarming, obviously you have to take action immediately. If you don't see anything out of the ordinary, then take the opportunity to start talking. The more you talk now, the easier it will be to talk about difficult topics later. ➢ Do know, understand, and respect the importance of their emotions. They’re going through a difficult, emotional time. ➢ Do know, understand, and respect the importance of their generational experiences. It’s human nature to think that everyone – especially our parents – think the way we do but they don’t. Understanding where they’re coming from is critical to your success. ➢ Do bring up difficult issues gradually – starting with the most urgent concerns. Don’t try to do all at once – you can’t cover everything in one conversation. ➢ Do find a quiet time – perhaps over a cup of tea – and allow time to stop and reintroduce later. ➢ Do look for the underlying cause rather than addressing the symptoms. For example, your father has a couple of fender-benders so you want to take away the car. But before you do, ask yourself if the problem is with his driving or could it be something else such as a problem with his eyes? ➢ Do help them see why change is in their best interest (You can make anyone want to change). For more information about talking with your aging loved one, please check out Barbara's website, www.AgeWiseLiving.com. Have you signed a Health Care Proxy so that someone will be able to make health care decisions for you if you are unable? Have you discussed your wishes for end of life care with that person? Have you given a copy of the Health Care Proxy to them and to your doctor? Have you signed a Durable Power of Attorney so that someone can manage your finances and property for you if you are unable? Does that person know where to find your important papers? Do you have a list somewhere of all your accounts, property, passwords, insurance policies, real estate and other important information? Have you updated your Will recently to make sure it still reflects your wishes? Are the people you appointed to serve as executor still available? Have you noticed any changes in Mom/Dad that worry you? If your parents, or you, are ready to get your plans in place and start 2009 off on the right foot, call my office for an appointment. Videocaregiving.org is a new visual education center for family caregivers. The videos are designed to be short, simple and direct, and are able to be accessed easily by the user at any hour of the day or night. Many of the videos follow a documentary format that uses real people and follows real situations. When you hear somebody with early stage Alzheimer's Disease describe their embarrassment and humiliation over being confused and not able to find their way home, you know that you are seeing a story told from the heart-a story that you can identify with and that may help you to better understand a situation that you, yourself, might be dealing with. The video material is able to turn words into pictures and scenes that can illustrate appropriate care-giving techniques and, in a sense, assure the user that he or she is not alone in this often lonely, difficult and stressful situation. The videos are short, and very informative. They have one on helping to breakdown tasks so that a person with Alzheimer's can be more involved with their daily activities. Other videos include nursing home discussions and information about driving and how to recognize when it is time to stop. Thanks t0 Sue Scheible over at A Good Age for bringing this site to my attention. Will You Be Responsible to Pay for Your Parent's Care? If a parent needs long term care - either at home or in a nursing facility, children may watch as their parent's savings dwindle to pay for the care, which can cost upwards of $5,000 - 10,000.00 per month. If the parent ends up meeting the eligibility criteria for Medicaid (called MassHealth in Massachusetts), then Medicaid will begin to pay for the care. But what if states required the children of the elderly to contribute to the cost of nursing home or at-home care? ...it fascinated me to learn that in 30 states, (Download 30 states ) adult children are legally responsible, at least on paper, to pay for necessities like food, clothing, shelter and medical attention for indigent parents. These statutes, known as filial responsibility laws, are modeled on the Elizabethan Poor Laws of 1601, which made blood relatives the primary source of support for family members, the elderly included. Public assistance was available only as a last resort. Massachusetts does have one of those laws on the books ( link to the Massachusetts general law on filial responsibility) although I doubt it's been enforced in the recent past. However, as Medicaid regulations tighten you never know what might happen in the future. Most of my clients who end up needing nursing home care have been cared for by their family members for years, first small things like a ride here or there, or meals and cleaning every so often, progressing up to full time live-in care before the health and safety of the elder requires more professional care. And while there are certainly some clients whose children haven't been involved with their care for whatever reason, they seen to be the exception rather than the rule. When I was a child, and my Nana was still alive, we visited her often. When we walked up to her door, her mailbox was to the left, and it has a sticker on it that said "Carrier Alert." After seeing it many times, I finally asked my mom what it was for. She explained that it was so that the mail carrier would notice if the mail hadn't been taken in from the day before, and would have someone check on Nana. Interested postal patrons register to participate in the program. Your local postmaster can give you more details on registration. Your letter carrier will be authorized to place a Carrier Alert symbol in your mailbox which will alert all letter carriers to watch your mail for any signs of distress such as an unusual accumulation. If your letter carrier finds an accumulation of mail, and you have not covered the sticker to signal that you will be away for a few days, he or she will notify the agency where you are registered or report your name to the postal supervisor who will report it to the agency. The social service agency will then try to contact you by phone. If you cannot be reached, the agency personnel will try to contact a friend or relative whom you have listed as a contact in the event of an emergency. If a friend or a relative cannot be reached, the social service agency will send a worker to your home to check on your health and well-being. If you or a loved one live alone, consider signing up for the Carrier Alert program, as an additional layer of protection. Is your parent a beneficiary of your estate? Some of my clients have their parents listed as primary or contingent beneficiaries of their estate. This may be a purposeful decision, or it may be because they named the beneficiaries many years ago before they had a spouse or children, or because their parent would inherit if a spouse predeceased them. Unless having your parents as the beneficiary of your estate was a purposeful and thought out decision, you may wish to check with them about having them possibly inherit from you. There may be tax ramifications for them that they wish to avoid, or if they are in a nursing home on Medicaid when you pass away, an inheritance could inadvertently affect their eligibility. Speaking with your parents, and maybe even coordinating with their attorney, would be the best course of action if you want to list them in your estate plan. As you get together with aging relatives this holiday season, or even as you see yourself and your siblings getting older, you probably know that there are questions you need to ask and things you need to know. If you have ever wondered where to start, here are an on-line and an off-line resource to get you started. Do you feel comfortable about your financial situation? Would a financial planner be helpful? Who should handle your finances if you become ill? In the event you become seriously ill, what sort of interventions would you like? Do you feel your doctor is well informed about the issues facing older patients? Can we help make your home more comfortable? Are you feeling secure about driving? Can you share your thoughts about your funeral? Can you compile a list of all your important information? Even if the answers to these questions is "I don't know" in the beginning, it's important to keep talking about it over time. And be sure to bring in professionals where needed - attorneys to review and draft estate plans, financial planners to help make financial decisions, contractors to make modifications to the home, etc. A great off-line tool for working through these questions is Susan Piver's book The Hard Questions for Adult Children and Their Aging Parents. The book has a chapter for you and your siblings to work through, and then has questions for you to ask your parents about their personal and family history, their finances, their legal issues and possessions, their health care and quality of life issues, and their spirituality. Remember, you don't need to pounce on your parents with all of these questions at once. These are conversations that can take place over time in the kitchen before dinner, while working together in the garden, while driving to an appointment or while taking a walk. At some point you may want to all sit down together to review finances or legal paperwork, but the main thing is to start the conversation and then take the necessary steps that arise. See my related post: More Questions to Ask Your Aging Parents. Why Hire A Geriatric Care Manager? A professional geriatric care manager has been educated in various fields of human services — social work, psychology, nursing, gerontology — and trained to assess, plan, coordinate, monitor and provide services for the elderly and their families. Advocacy for older adults is a primary function of the care manager. An important part of working with the client and their families is chemistry. Be sure you get along with and like the individual you are considering hiring. A relationship with a professional geriatric care manager can allow the children of the elderly person to be children, while someone else manages the situation. When a son or daughter is providing the hands-on care to the parent, the quality time they have to be there emotionally for their parent is limited…. The care manager can handle the difficult interpersonal issues, address the immediate problem, remain connected once the crisis passes and get back involved as the situation requires it. Geriatric care managers are a great addition to the team, and can help clients determine what their care giving needs are, what facilities would be best for them, help with adjusting to new living situations and facilitate family meetings to insure that relationships remain intact even during difficult times. Technology advances are being made which make it easier for people with vision problems, arthritis, and hearing problems to be be able to use the latest "toys" like cell phone and personal computers. Having access to a cell phone can provide seniors and their family members with a great sense of security - since mom or dad will be able to make a call in an emergency away from home. And if they are a gad-about, like many of my clients, they can be reached by their children if they are out with friends or at an activity. Likewise, I'm finding that more of my older clients own computers and use them to keep in touch with their children and grandchildren who might be across town, across the country or even across the globe. Being able to communicate more frequently, and to easily receive pictures and videos though email, can make families closer, even though they may be far apart. The Boston Globe has an article about some of the new products available. Do not visit if you are sick. Do not bring small children to visit if they are sick. Wash your hands before going for the visit. Use the hand sanitizer at the check-in desk on your way in to prevent carrying germs in, and on your way out to prevent carrying germs out of the facility. If you find yourself having to cough, use the crook of your elbow to cover your mouth, not your hand. If you sneeze, use a tissue and wash your hands. A few minutes of prevention will go a long way towards protecting you, your loved ones, and the other patients in the facility from the risk of illness. It's Fall Prevention Awareness Day today. If you are caring for a elderly loved one, or if you yourself are getting up in years, you know the importance of preventing falls. An otherwise healthy person can find them in a downward of spiral of medical problems after a fall. Ways to prevent falls are to keep the floors clear and minimize or get rid of throw rugs, install grab bars in the bathroom, make sure there is adequate lighting, practice your balance with yoga or tai chi, and talk to your doctors about your medications if they are making you dizzy or groggy. Click below for a printable document on fire and fall prevention. The Falls Prevention Helpline at the Massachusetts Department of Public Health is 1-800-227-SAFE. Call for information and resources about falls prevention in your community. Thanks to Sue Scheible at the Patriot Ledger blog A Good Age for posting about this important issue. The federal government has a new site for caregivers at Medicare.gov. It covers topics such as billing, navigating Medicare, care options and provides resources for caregivers who are feeling overwhelmed. It even has a section on long term care and determining what your choices are for care, and how to pay for it. The site provides guidance on reading a Medicare coverage summary, and is very clearly laid out. There is also a printable version and a screen reader version to make the information accessible to those who have difficulty using or accessing a computer. Say "Hello in there, hello." I seem to have spent a few days this week visiting clients in the nursing home, and so I had this song running through my head. Many times, residents of the homes don't have family near by that can visit, or they have no family at all and are feeling scared, sad and isolated. Despite their age, they still crave interaction and are interesting, funny, feisty, cranky and human. Sometimes they just want someone to sit outside with them when the staff may be too busy. Sometimes they are looking for someone to speak with them in their native language, or even to help them write their memories down. If you or someone you know is interested in volunteering to be a visitor to an elder, you can contact Match Up, Interfaith Volunteers in the Greater Boston area. MATCH-UP volunteers help elderly and disabled adults with almost anything one friend might do for another: talk together, write letters, read aloud, go for walks, help get to appointments, visit by phone, and much more. MATCH-UP attracts volunteers of all ages, backgrounds, and faiths. They come from congegrations, universities and schools, businesses and corporations, and the community at large. As they get older, some of our volunteers even become MATCH-UP seniors themselves, gratefully receiving our services just as they once gave their time and support. For volunteer opportunities on the South Shore, contact South Shore Elder Services. 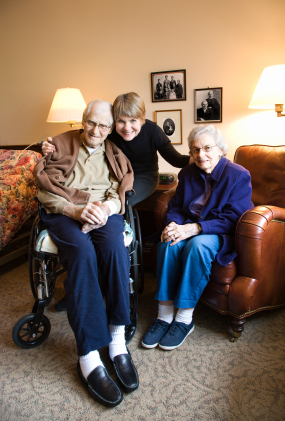 It's a common scenario for families with aging parents who need care - one or two siblings take on the bulk of the work, whether due to proximity, scheduling, expertise or just a sense of duty. And then there are the siblings who, for whatever reason, don't help as much or at all. This can lead to a lot of resentment and even arguments. In the book How To Care For Aging Parents, a book I often recommend to clients, the authors recommend having a family meeting to try to sort through some of the issues. You may even wish to involve a mediator who is trained in working with families. At a certain point, however, it may just be that you need to realize that your siblings aren't going to help out no matter how much you think they should. It is fair? No. It is life? Yes. If you find that you are doing the bulk of care for your parents, make sure that they have signed health care proxies and durable powers of attorney appointing you as their agent. These documents give you the legal authority to act on their behalf. This is very important because if they become unable to care for themselves and these documents are not in place, it may become necessary to appoint a guardian or conservator. A guardian or conservator is appointed by the Court, rather than chosen by your parents. If you do assist your parents in finding an attorney to draw up their planning documents, keep in mind that a good attorney will speak to your parents privately to ascertain their wishes. While the attorney will explain your duties and obligations under the documents, her clients are the parents, not the children or the family as a whole. This protects your parents and makes sure that their wishes guide the process. For more information on making sibling relationships work for elder care, check out the podcasts at AgeWise Living.